Full of flavour, this is an easy recipe to make for one or more. 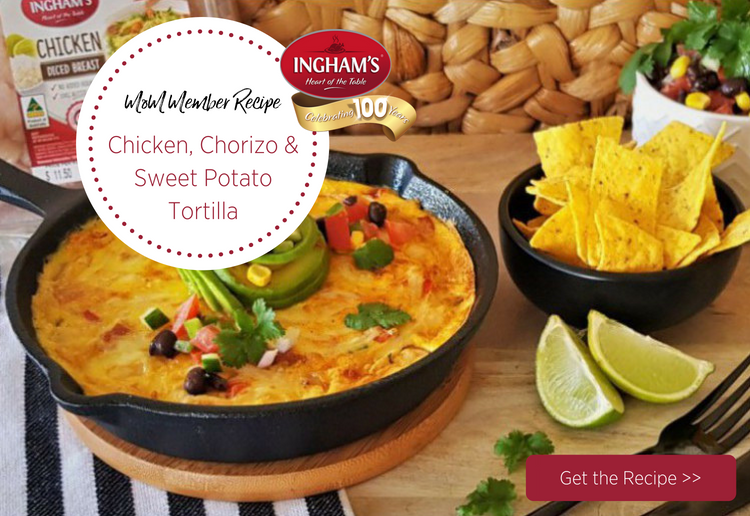 Loaded with healthy ingredients, it can be made as a tortilla to share or individual serves. Left overs are delicious served cold. Heat a heavy based, non-stick, oven proof frypan, lightly oil. Add the chorizo and 1/2 a red onion, fry for 2-3 minutes. Add the chicken, sweet potato and red capsicum, cook until the chicken and the sweet potato are just cooked . Beat the eggs and taco seasoning, pour over the sweet potato & chicken mixture. Continue cooking, over med heat until the tortilla is almost set, sprinkle with cheese and place under a hot grill until the cheese melts and the top is set & golden brown. To make the salsa, combine the black beans, diced tomato, green capsicum, remaining red onion, cucumber and sweet corn. Mix the mayonaise, sweet chilli sauce and lime juice, toss through the salsa. To serve, slice or mash the avocado (with a little lemon juice), place on top of the tortilla and spoon a little salsa on top. Notes... Serve with corn chips or as part of a larger Tapas meal, when friends or family drop in. Great recipe for sharing or entertaining very healthy and full of the good stuff sounds great! Definitely great for entertaining guests, lovely idea. This recipe sounds amazing, the flavours would be lovely! This looks and sounds amazing – so flavoursome. I can’t wait to try it. Amazing and delicious flavours, thanks for sharing. Love your presention of the meal. This will be an interesting one to get the family to eat. What an excellent recipe – I love finding new, fun and healthy recipes to cook. I will definitely be making this one! My kind of recipe,tasty and delicious! Thanks! oh my goodness this looks amazing!! – I love mexican inspired food, and your salsa looks the bomb! A tasty and colourful looking share meal – perfect for a relaxing weekend. A nice share meal to have for date night with a nice cold drink.